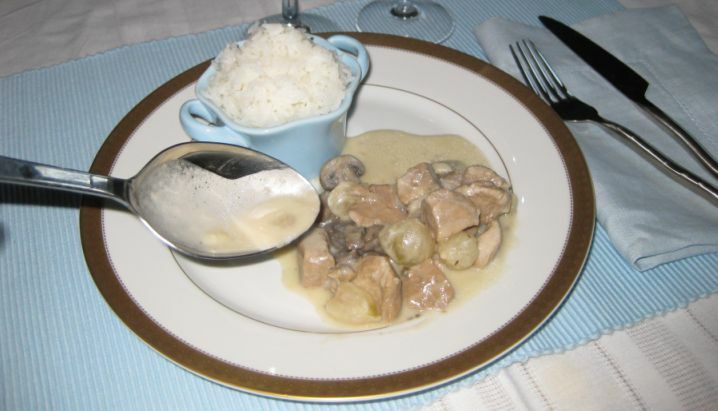 All of the recipes are for Blanquette de Veau (veal) but here in the States it is difficult to find Veal so I opted to use Pork instead. 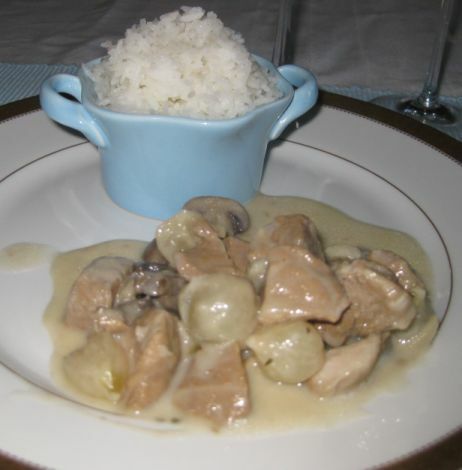 A Blanquette de Porc is a stew with a light, creamy sauce and perfect showcase for tender pork that just melt in your mouth. 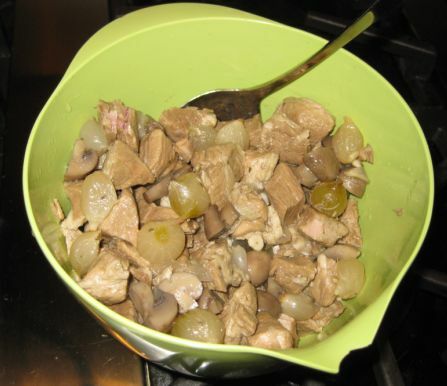 Traditionally all the ingredients are white, veal (as white as you can get), onion, button mushrooms, white wine, and crème fraîche and sometimes carrots are slip in. 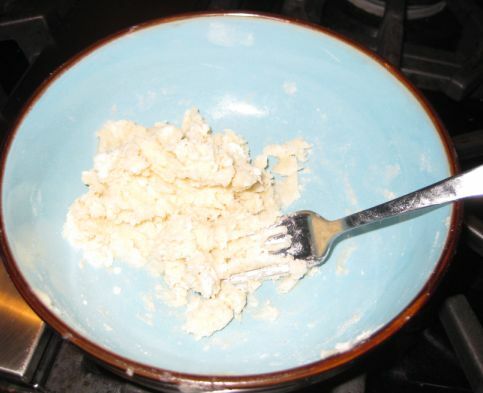 It is very rare you will find this dish in restaurants because it is a homey recipe. 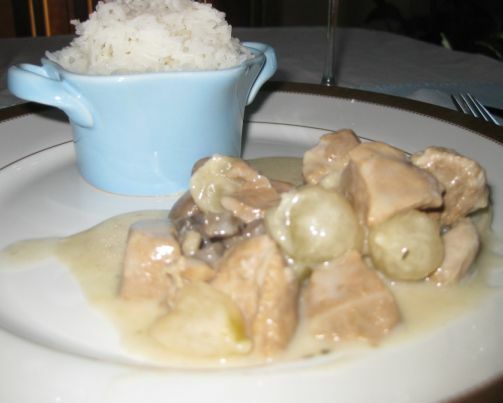 The dish is not a luxurious dish and used modest cuts of meats and should be accompanied by white rice or noodles, everything should be white, but it is a comfort dish, best eaten when the weather is cold. 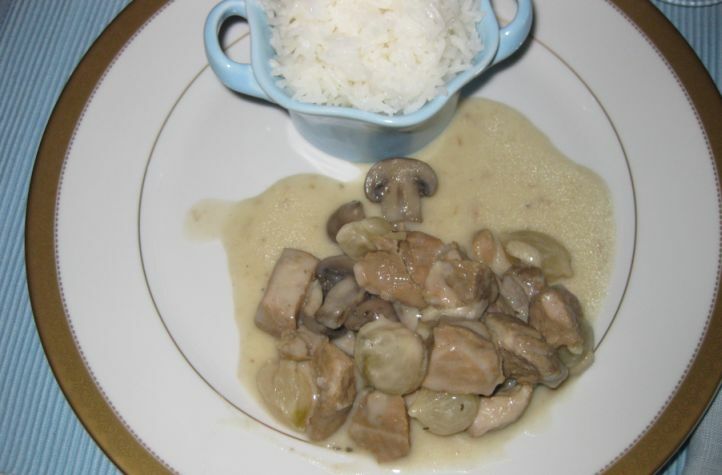 I enjoy the taste of the Blanquette because it is creamy but yet light and the meat is so tender. 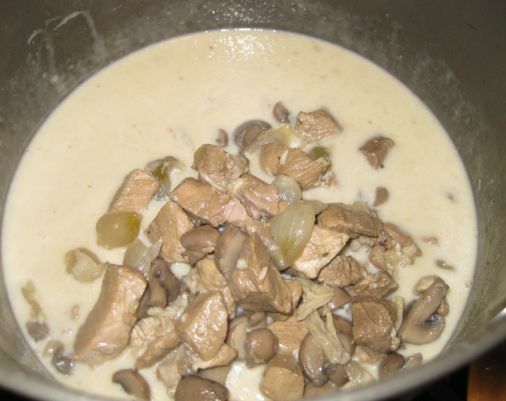 The Blanquette is fairly easy to prepare but make sure to plan accordingly for time because braising the meat is a bit lengthy. 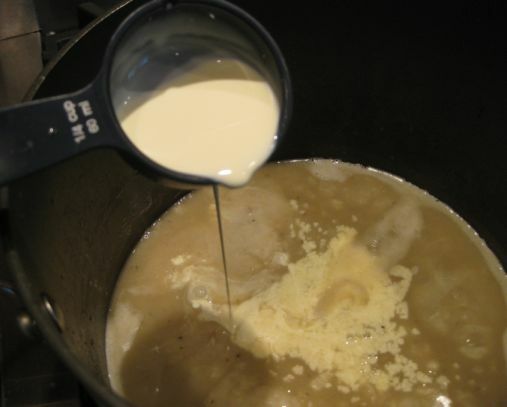 There are 2 steps in preparing the Blanquette: in the 1st phase the meat is braised for tenderness and then in the 2nd phase the braised liquid is converted into a béchamel sauce. I usually serve the Blanquette with rice instead of noodle. I use pork butts for this dish. 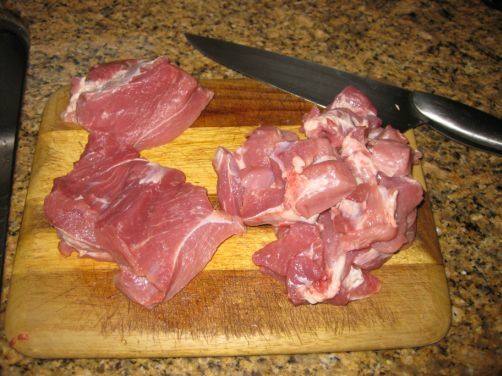 Cutting the pork into small pieces. 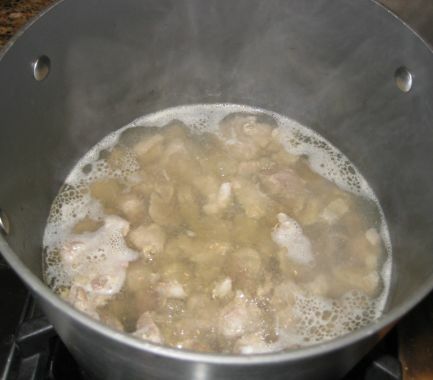 The pork is put into a large pot with water and then bringing it slowly to a boil, skimming often for at least 10 to 15 minutes. 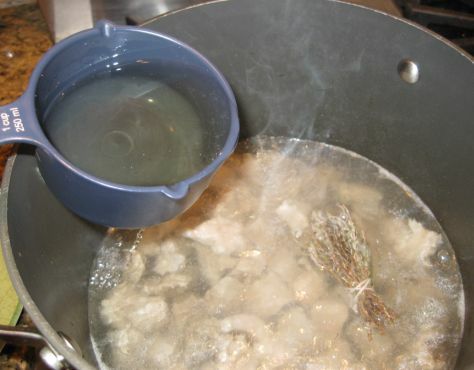 A bouquet garni, is a bundle of herbs usually tied together with string and mainly used to prepare soup, garlic, white pepper, salt, and white wine is added to the pot and simmered for a good hour to an hour and a half. 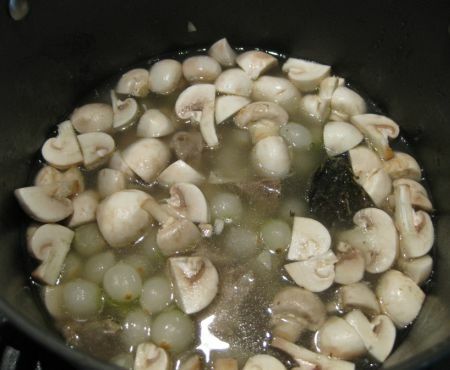 White pearl onion and mushrooms are stirred in and the simmering continued for 20 minutes or so until the vegetables are tender. All the meat and vegetables are transferred to a bowl and set aside. 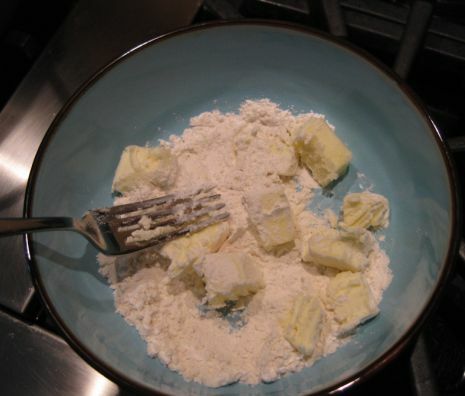 Kneading the flour and butter together until the flour particles are coated in butter. 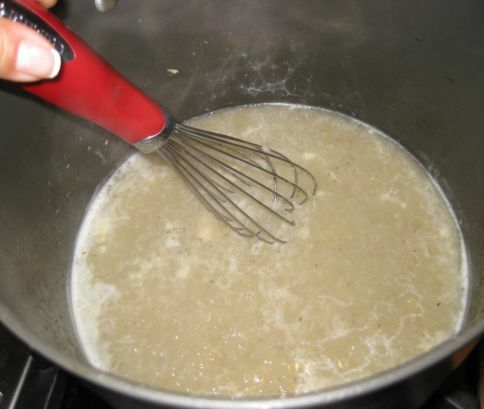 When the beurre manié is whisked into a hot or warm liquid, the butter melts, releasing the flour particles without creating lumps. Whisking all the beurre manié until the broth is thicken..
Then heavy cream is added. 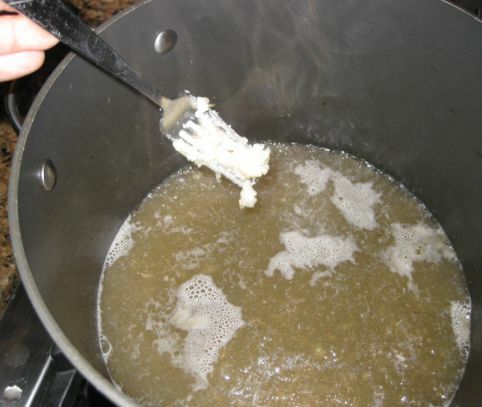 The broth/sauce is brought to a boil. Taste the sauce and then adjust the seasoning accordingly. The meat and Vegetable are stirred back in the pot and heated until hot and then it is ready to serve.